We’d love your help. Let us know what’s wrong with this preview of Blacklisted by History by M. Stanton Evans. But that conventional image is all w Accused of creating a bogus Red Scare and smearing countless innocent victims in a five-year reign of terror, Senator Joseph McCarthy is universally remembered as a demagogue, a bully, and a liar. History has judged him such a loathsome figure that even today, a half century after his death, his name remains synonymous with witch hunts. But that conventional image is all wrong, as veteran journalist and author M. Stanton Evans reveals in this groundbreaking book. The long-awaited "Blacklisted by History," based on six years of intensive research, dismantles the myths surrounding Joe McCarthy and his campaign to unmask Communists, Soviet agents, and flagrant loyalty risks working within the U.S. government. Evans's revelations completely overturn our understanding of McCarthy, McCarthyism, and the Cold War. Drawing on primary sources--including never-before-published government records and FBI files, as well as recent research gleaned from Soviet archives and intercepted transmissions between Moscow spymasters and their agents in the United States--Evans presents irrefutable evidence of a relentless Communist drive to penetrate our government, influence its policies, and steal its secrets. Most shocking of all, he shows that U.S. officials supposedly guarding against this danger not only let it happen but actively covered up the penetration. All of this was precisely as Joe McCarthy contended. "Blacklisted by History" shows, for instance, that the FBI knew as early as 1942 that J. Robert Oppenheimer, the director of the atomic bomb project, had been identified by Communist leaders as a party member; that high-level U.S. officials were warned that Alger Hiss was a Soviet spy almost a decade before the Hiss case became a public scandal; that a cabal of White House, Justice Department, and State Department officials lied about and covered up the Amerasia spy case; and that the State Department had been heavily penetrated by Communists and Soviet agents before McCarthy came on the scene. Evans also shows that practically everything we've been told about McCarthy is false, including conventional treatment of the famous 1950 speech at Wheeling, West Virginia, that launched the McCarthy era ("I have here in my hand . . ."), the Senate hearings that casually dismissed his charges, the matter of leading McCarthy suspect Owen Lattimore, the Annie Lee Moss case, the Army-McCarthy hearings, and much more. To ask other readers questions about Blacklisted by History, please sign up. Does any one see a myriad of parallels between this book and what is going on currently in government? Do we ever learn? This is one of those books that will trigger you to kill anyone who wants to convince you that the earth is round, while you staunchly insist that it is flat. So, if you are one of those people who refuse to walk away from your own truths and discover new possibilities, STAY AWAY! This book will rock your world! I've been reading this book for many weeks now. It's so packed with facts, well documented research and history, that it takes time to absorb it all. Based on the new information which wa This is one of those books that will trigger you to kill anyone who wants to convince you that the earth is round, while you staunchly insist that it is flat. So, if you are one of those people who refuse to walk away from your own truths and discover new possibilities, STAY AWAY! This book will rock your world! Based on the new information which was released in the Venona papers of 1995, the story of a vilified politician changed considerably and the author made a conscientious effort to fact-check his information. He had to debunk a witch-hunt against a person who got an era named after him, although Joe McCarthy was not the main peanut in the packet in this sordid saga. The book, and the facts which was released from the Russian archives in 1992 painted a totally different picture from the one which was so willingly and consciously sold to the public by the opponents or even enemies in politics and the press. So many blatant lies were forced upon an unsuspecting public as facts that it will take a megacity of dedicated and determined researchers to finally turn the tables on the disjointed misinformation campaign which served a political agenda in the 1950s. The author managed to debunk a multitude of these lies and assumptions, and confirm other attributes of a man who was in actual fact an enigma. Mr. Evans went in search of the real man in this book, and came up with a character that boggles the mind. So yes, in this sense the book is controversial. Some readers are angry with the bias in the book. That's true. Just as true as the bias against a man who did very little of what he was accused of by the politicians and media who loved to hate him and get him blacklisted for life. The pot calling the kettle black and now screams to heaven for being exposed. Government records, Venona papers and the Russian archives finally confirmed the accuracy of Joe McCarthy's allegations towards government employees who were spying for the Russians. All confirmed now. Done and dusted. In the end, Senator McCarthy was censured by his colleagues and condemned by the press and historians. But as Evans writes, "The real Joe McCarthy has vanished into the mists of fable and recycled error, so that it takes the equivalent of a dragnet search to find him." "Blacklisted by History" provides the first accurate account of what McCarthy did and, more broadly, what happened to America during the Cold War. It is a revealing expose of the forces that distorted our national policy in that conflict and our understanding of its history since. The book spans an amazing era covering several decades. How fortunate to read it now and understand history better. Thank you, Mr. Evans, for providing the evidence of what really happened in America during the Cold War era. The new generations deserve two sides to the pancake. There is an old saying which states: A lie can travel half way around the world while the truth is putting on its shoes. But it's also true that the truth always catches up. If there are any honor and integrity left in this cesspool of dirty politics, we should grab onto it and acknowledge our own mistakes and prejudices. It is a liberating experience. This book will set you free, if you let it. Congratulations to Mr. Evans or an excellent piece of work. A biased, well researched book. OK, disclosure first, I didn't finsih the book. I stopped on page 151 out of 600. I just couldn't take it any more. Evans' view is that Joseph McCarthy is undeserving of the mantle that history has laid out for him. He was simply the leading figure in the few that were properly acknowledging the enormous problem of Communist infiltration of the US Government during the 1940s and 1950s. Evans attempts to prove this by laying out the case against people that McCarthy A biased, well researched book. OK, disclosure first, I didn't finsih the book. I stopped on page 151 out of 600. I just couldn't take it any more. Evans' view is that Joseph McCarthy is undeserving of the mantle that history has laid out for him. He was simply the leading figure in the few that were properly acknowledging the enormous problem of Communist infiltration of the US Government during the 1940s and 1950s. Evans attempts to prove this by laying out the case against people that McCarthy accused. He has volumes of declassified files from the FBI and the former Soviet Union. He manages to make a case against these particular individuals. He makes no mention of anybody that McCarthy or his fellows accused with no credible evidence. He dismisses McCarthy's tactics and extremism. He has volumes of references and footnotes, but doesn't use them consistantly. Many times he made extreme claims that I wanted to double check, only to find no reference for that particular remark. Evans is a journalist, not a historian, which comes across in his writing. A historian would have at least tried to appear unbiased. Evans makes no such attempt. His casual use of terms such as Red and Comrade interchangably with Communist and agent just make me question his entire premise and his arguments, and logical decision making. In short the book (the part that I read) is a long condemnation of a particular circle of people in the State Department and other agencies during the 40s and 50s. Little is actually said about McCarthy. I bought the book in the Sacramento airport and started reading it on the plane home in September 2008. Stanton Evans, a true student and researcher into the Cold War, has vindicated all those who have defended Senator Joseph McCarthy for his long and lonely effort to expose some of the communists and traitors who were inhabiting federal positions of trust. The careful documentation of Stanton's long-researched book speaks for itself. When coupled with the excellent book "The Venona Secrets," th I bought the book in the Sacramento airport and started reading it on the plane home in September 2008. Stanton Evans, a true student and researcher into the Cold War, has vindicated all those who have defended Senator Joseph McCarthy for his long and lonely effort to expose some of the communists and traitors who were inhabiting federal positions of trust. The careful documentation of Stanton's long-researched book speaks for itself. When coupled with the excellent book "The Venona Secrets," the truth is there to see and backed up by plenty of documentation. More "stuff you don't learn in school" - not only was the Communist threat to the country real and the infiltration unbelievably thorough, but thanks to documents that have been released in the last few years, we actually have (long-suppressed) evidence that McCarthy had something right. Not perfect, but he was on to something (which, incidentally, had been pursued by another congressman a few years earlier, as well). Even more remarkable is that so many of the actual records of his hearings and More "stuff you don't learn in school" - not only was the Communist threat to the country real and the infiltration unbelievably thorough, but thanks to documents that have been released in the last few years, we actually have (long-suppressed) evidence that McCarthy had something right. Not perfect, but he was on to something (which, incidentally, had been pursued by another congressman a few years earlier, as well). Even more remarkable is that so many of the actual records of his hearings and related archives are missing. That tantalizing bit alone is worth the read - and it's in the beginning of the book. At any rate, again, Evans is pretty wordy and academic - although he does insert some surprising wry humor - and I think this book is definitely worth checking into and reading what you can. This book changed me. I swallowed rage. The evil that was perpetrated by communist spies destroyed my illusions. You will think that I listened only to one side of the story. But that is untrue. I read McCarthy and the Fear of Communism in American Historybefore, and I read Shooting Star: The Brief Arc of Joe McCarthy after. If the truth isn't too strong for you. Read this book. You will change. Exhaustive research. One can only imagine what else he would have been able to expose had no so many vial documents "disappeared". Another subtitle could be, "The Pilfering of Truth". THIS BOOK OFFERS JAW DROPPING REVELATIONS ON EVERY PAGE. I went into this with the attitude that McCarthy wasn't as bad as everyone says. This book correctly frames the issues and what was at stake. The McCarthy era wasn't about him destroying innocent people's lives or anything like that. McCarthy was the victim OF Exhaustive research. One can only imagine what else he would have been able to expose had no so many vial documents "disappeared". The McCarthy era wasn't about him destroying innocent people's lives or anything like that. McCarthy was the victim OF THE WITCH HUNT, not it's conductor. Ronald Reagan famously said, "Well, the trouble with our liberal friends is not that they are ignorant, but that they know so much that isn't so." Of course, that's often true for all of us, and as far as Cold War topics go, I think Joe McCarthy must be near the top of the list of things about which what we know isn't so. The author went back to look at primary materials to investigate many claims made by historians, such as "McCarthy didn't name names." In fact, one of the reasons I couldn't rat Ronald Reagan famously said, "Well, the trouble with our liberal friends is not that they are ignorant, but that they know so much that isn't so." Of course, that's often true for all of us, and as far as Cold War topics go, I think Joe McCarthy must be near the top of the list of things about which what we know isn't so. The author went back to look at primary materials to investigate many claims made by historians, such as "McCarthy didn't name names." In fact, one of the reasons I couldn't rate this as 5 stars was that there were so many lists of names. Absolutely essential for the point, but long lists of dead American Communists does not good reading make. Then there is the red herring that McCarthy's actions didn't lead to prosecutions. Actually, there were a couple, but prosecution wasn't his goal in the first place. He just wanted these people, many of whom were obvious security risks or simply didn't have the US's interests at heart, removed from sensitive positions in the government. There is also a common perception that McCarthy was throwing around baseless charges. His sources were generally FBI investigations and other security information that came directly from Federal agencies like the State Department or the Army. The problem wasn't that his information was bad, but that it was generally good and very troubling. The infamous "Have you no shame!" line was tragically ironic. It was in reference to McCarthy (having been baited) making a statement about a lawyer with past ties to known Communist front groups. The irony was that a few months previously, the man accusing McCarthy of having no shame had removed the same lawyer from his team (to oppose McCarthy) for the exact reason brought up by McCarthy. And there was a New York Times article, with a large printed picture of the lawyer, documenting all of this. He documents many outright falsehoods made by contemporary enemies of McCarthy: Sen Tydings eventually admitted under oath that he had lied about possessing a recording of McCarthy's Wheeling speech. Tydings also made up claims about Republican Congressional committees having reviewed McCarthy's lists previously and determined the claims to be baseless. I think this book goes a long way to vindicate McCarthy, and points out that even though the Truman and Eisenhower administrations would never admit it, security did tighten up a bit once McCarthy started shining lights on the ridiculous security practices of the Federal Government. If you can read this book with an open mind you will gather valuable information. You must discard all the false “facts” thrown at you in school. And, please, forget the idea that McCarthy started HUAC: he was a Senator, for crying out loud! The mists of lies and fabrications spread for so many years will vanish and the truth will enlighten you. Among the things you will learn is that the precursor of the investigations imputed to Senator McCarthy, was actually a committee headed by a Democrat i If you can read this book with an open mind you will gather valuable information. You must discard all the false “facts” thrown at you in school. And, please, forget the idea that McCarthy started HUAC: he was a Senator, for crying out loud! The mists of lies and fabrications spread for so many years will vanish and the truth will enlighten you. Among the things you will learn is that the precursor of the investigations imputed to Senator McCarthy, was actually a committee headed by a Democrat in 1918—not even Wikipedia dare to deny this fact. You will also learn the links between McCarthy and another communist fighter: Robert Kennedy--yes, the very Bobby Kennedy! During the early 1950s Bobby was a staff lawyer to Senator Joseph McCarthy, made him the godfather of his first child, and when McCarthy died in 1957 attended his funeral. At a speech by Murrow (CBS) attacking McCarthy, Bobby walked out in protest. In its 605 pages, veteran journalist M. Stanton Evans gives specific details and reveals confidential Communist records of Soviet spy networks within the U.S., South America, Europe, and especially their connections with China in a joint attempt to control U.S. Ameri-Asian policy. It also details and explains documented [but not talked of by our media] legal trials of U.S. citizens found guilty--not by McCarthy but by a federal court of law--of espionage and treason. Those things don't get much a In its 605 pages, veteran journalist M. Stanton Evans gives specific details and reveals confidential Communist records of Soviet spy networks within the U.S., South America, Europe, and especially their connections with China in a joint attempt to control U.S. Ameri-Asian policy. It also details and explains documented [but not talked of by our media] legal trials of U.S. citizens found guilty--not by McCarthy but by a federal court of law--of espionage and treason. Those things don't get much air time in our culture. A portion of the book's conclusion reads, "Perhaps the easiest way of judging the matter is to note that McCarthy, throughout, was battling for public disclosure of the relevant data, while the typical stance of his adversaries was to suppress or obscure the facts, on whatever pretext. Usually in such confrontations, it isn't difficult to figure out that the people trying to hold back information are the ones who will be embarrassed by it and thus the people who aren't being truthful. Concealment of data by his foes was so consistent a feature of the McCarthy saga it's hard to believe the writers who take the part of his opponents can't see it. If you ever read reviews by Booklist, Publisher's Weekly or Library Journal and believe their detractions of any writer who is not a Liberal, you would probably pass on this book. In my case, I generally read their reviews to ascertain how accurate an author is, because their reviews are what I call "parallel opposite"; in other words, if, for example, they accuse a writer of inaccuracy, I conclude the opposite is most likely to be true. In Evans' case, the three relate the rehabilitation of mal If you ever read reviews by Booklist, Publisher's Weekly or Library Journal and believe their detractions of any writer who is not a Liberal, you would probably pass on this book. In my case, I generally read their reviews to ascertain how accurate an author is, because their reviews are what I call "parallel opposite"; in other words, if, for example, they accuse a writer of inaccuracy, I conclude the opposite is most likely to be true. In Evans' case, the three relate the rehabilitation of maligned Senator McCarthy's character, as Publisher's Weekly put it, "worn ground"... Publisher's Weekly goes as far as to accuse the author of "given to conspiracy thinking" and following "different rules than historians," and Booklist labels him "conservative"--and I am sure I missed the Liberal writers they accurately labeled! Booklist even goes as far as to say the documents about McCarthy cases to "have significant gaps" although providing no examples. If all these excellent reasons for anyone with critical thinking to grab this book and read it are not enough, there is also Ann Coulter's article "MCCARTHYISM: THE ROSETTA STONE OF LIBERAL LIES" (http://www.anncoulter.com/columns/200...). "Fake news" has been around a long time. Joe McCarthy was right that the State Department, among other federal agencies, had known Communists in its employ. It is a tragedy that not only was this truth deliberately obscured, but the life of a decent man was destroyed as a result. Evans painstakingly details the evidence for McCarthy's claims that particular people were working within the federal government to pursue an agenda that benefited Russia, not the United States. There are too many to me "Fake news" has been around a long time. Joe McCarthy was right that the State Department, among other federal agencies, had known Communists in its employ. It is a tragedy that not only was this truth deliberately obscured, but the life of a decent man was destroyed as a result. Evans painstakingly details the evidence for McCarthy's claims that particular people were working within the federal government to pursue an agenda that benefited Russia, not the United States. There are too many to mention, but two in particular stood out for me. Evans explains how those working in China persuaded the US to support Mao Zedong over Chiang Kai Shek . . . and look how that turned out. Evans also describes how they were able to increase antagonism between the United States and Japan -- for the purpose of bringing the US into World War II. It's remarkable the level of abuse that McCarthy suffered -- most inexcusably, from other senators, who must have known the truth of his allegations, but also from the media, who portrayed him as a contemptible figure. How relevant to today's news to see how easily a man's reputation can be destroyed, and how the public can be led to write off someone who in reality is doing important work. I feel like I owe this book a more in-depth, detailed review than the one I'm going to give it. There is a mountain of things I've been thinking of saying when I finally got to the end of the book and was ready to review, but at this point....I am overwhelmed by all of them, so I will do a short version now. Perhaps later I will come back and edit this into the dissertation that it deserves, but that night is not this night. Let's start with the obvious. This is not the book to read if you don't I feel like I owe this book a more in-depth, detailed review than the one I'm going to give it. There is a mountain of things I've been thinking of saying when I finally got to the end of the book and was ready to review, but at this point....I am overwhelmed by all of them, so I will do a short version now. Perhaps later I will come back and edit this into the dissertation that it deserves, but that night is not this night. Let's start with the obvious. This is not the book to read if you don't want your worldview challenged. The author presents a very different picture of the Cold War than you're going to read in just about any history book. You don't have to agree with everything in or concur with all of the author's conclusions to benefit getting outside your own head a bit. what is the point of re examining a fifty year old cold war incident? every day i read of some washington scandal with no real resolution. why isn't sandy berger in leavenworth for example? guess it will take fifty years to get any answers. and stanton evans is right on time. a few people have made careers out of distorting the truth surrounding the mccarthy era. thousands more stood by and let them. i as never really able to focus on the case before. every book and movie, there are hundreds, al what is the point of re examining a fifty year old cold war incident? i as never really able to focus on the case before. every book and movie, there are hundreds, always seemed to repeat the same few details. became clear that most "experts" were merely repeating stuff they saw in the manchurian candidate, with no real research in original sources. this book corrects a lifetime of misinformation. I'm reading this in small doses because I'm interested in the history of this era, but it's not pleasure-reading. Evans presents a very accessible, well-researched, and thoroughly documented look at how the communist organization in America succeeded in demonizing Senator Joseph McCarthy. Debunks many myths about his personal as well as his political life. Turns out that the real "McCarthyism" was the campaign that McCarthy's enemies employed against him. Absolutely stunning defense of McCarthy. He was right all along the line. He was brought down by the progressives because he was too effective at rooting out their ilk from government service. Evans' backup material is flawless. His research is impeccable. This should be required reading at American colleges rather than BHO's tracts in favor of socialism. I recently came across M. Stanton Evans' relatively recent book (2007) entitled Blacklisted By History (The Untold Story of Senator Joe McCarthy--And His Fight Against America's Enemies). Having grown up during the events in this book, I was generally familiar with what came to be known as the Red Scare of McCarthyism. Suffice it to say, my impressions and recollections of McCarthy weren't very positive. 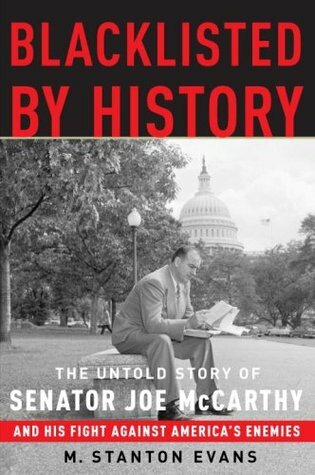 After hearing about this book, I thought I would give another view of the McCarthy story a f I recently came across M. Stanton Evans' relatively recent book (2007) entitled Blacklisted By History (The Untold Story of Senator Joe McCarthy--And His Fight Against America's Enemies). Having grown up during the events in this book, I was generally familiar with what came to be known as the Red Scare of McCarthyism. Suffice it to say, my impressions and recollections of McCarthy weren't very positive. After hearing about this book, I thought I would give another view of the McCarthy story a fair reading. Initial impression of Evans' book is the sheer size of the volume (663 pages, 45 Chapters). It quickly becomes apparent that this is no incidental survey or overview of the subject of Senator Joe McCarthy. The 11-page Prologue wets the reader's appetite by revealing what the author's goals were, what his (and his staff's) investigative method and source locations were and their commitment to leaving no stone unturned in seeking to uncover all available first-hand documentation, reexamining sources cited by previous authors, and a careful examination of the pertinent information contained in the former Soviet Union's "Venona" files. In short, this was a very serious undertaking with a view toward discovering and telling "The Untold Story Of Senator Joe McCarthy And His Fight Against America's Enemies." "What the disclosures do mean is that the whole question of his [McCarthy's:] cases needs to be reexamined in the light of the new information, and can't be dismissed out of hand with sweeping statements about the absurdity of the larger thesis." In Blacklisted By History, Evans does not simply focus on Joe McCarthy and the events surrounding his assault on Communism in the American government during the 1950s. He divides his book into six parts. In Part 1, Evans includes the previously mentioned Prologue and then provides background information about Joe McCarthy, the events surrounding his committee's investigation and accusations and what Evans thinks is an inaccurate "caricature" of Senator Joe McCarthy (Prologue - Chapters 1-5). Evans spends a significant amount of time (Chapters 6-13) establishing the relevance of other investigations into Communist activity during the several decades prior to Senator McCarthy's entrance into the national spotlight. Although this section is at times tedious and time consuming, I think it provided Evans with an invaluable and solid support for the material he later collected on the McCarthy years. Evans indicates that few Americans are even aware of this information, let alone have spent the time and effort to collect and piece together this kind of groundwork material before launching an attack on Senator McCarthy. Moving into Part III, Evans enters the era of Senator Joe McCarthy (1950). The first thing he addresses is all of the accusations hurled at McCarthy shortly after his now infamous speech in Wheeling, West Virginia, where he allegedly stated that there were at that time 205 Communists still employed in the State Department. McCarthy insisted he referred to only 57, referring to the 205 figure from a letter written by the Secretary of State James Byrnes in 1946. Soon, a perjury investigation ensued which led to calls for McCarthy's formal censure and removal from his Senate seat. Evans meets this head-on and lays out the results of his interviews and document searches which correct the record and actually exonerate McCarty. According to Evan's research, even John Howe (aid to Senator William Benton), one of McCarthy's severest critics, later admitted after reviewing this new evidence that the news stories about McCarthy were fallacious and he was innocent of perjury. Evans states that with the exception of one book on McCarthy (bottom of page 193) John Howe's memo chronicling the errors made about Senator McCarthy's statements would "...all but vanish from chronicles of the era--ignored in most studies of McCarthy, referred to obliquely and not too accurately in a couple, and otherwise consigned to the oblivion of the archives (and hard to locate there). Likewise, the misgivings expressed by Howe were kept discreetly private, and may be found today only by rummaging through ancient papers. By such devices do facts of record, for purposes of political history, become officially nonexistent." In Chapters 18-23, Evans really shows off his skill for getting behind the scenes regarding what and why McCarthy's critics were so hell-bent on removing him from political service. He does this as an example to others who may also desire to mount a similar crusade by digging into the less than desirable internal affairs of the U.S. government. He reveals the Tydings hearings for the sham they really were by uncovering memo correspondence (some even involving President Truman) that clearly demonstrated the hypocrisy of the hearings. Tydings and his committee were tasked to conduct (according to the terms of Senate Rule 231) a "full and complete investigation as to whether personnel disloyal to the United States are or have been employed by the Department of State." However, rather than the committee doing this, they left the investigating up to McCarthy with a view toward eventually bringing charges against him, his public disgrace and eventual removal from the U.S. Senate. For me, this part of the book was the most interesting, revealing, and at the same time, the most embarrassing to me as a U.S. citizen. Evans provides this surprising summary of Part III: "Throughout, the White House, Department of Justice, and other agencies of the Truman government showed far more interest in tracking down McCarthy's sources than in uncovering alleged Soviet agents or Communist Part members, or in addressing the lax security standards deployed by the LRB [Loyalty Review Board:]. In view of the Truman administration, the problem with Joe McCarthy was not that he didn't have inside sources of loyalty data but that he all too obviously did. Which was from a national security standpoint beneficial, as information on such cases was sorely needed." In Part IV, Evans pulls the kid gloves off and begins naming names. He opens the section by saying, "It is impossible to understand the McCarthy ear and its security wars without fist understanding something of Harry Truman--which, however, is no easy task. One this subject, and certain others, Truman is a hard man to figure." Without coming right out and stating that the entire Red security debacle was President Truman's fault, he does debunk the historical assertion that Truman had, through his aggressive loyalty program, actually cleaned up all of the Communist security risks before 1950 when McCarthy allegedly came barging in with his outrageous charges. Evans begins to pick this viewpoint apart by a systematic, person-by-person accounting Chapters 24-32) of case file evidence pertaining to key Communist employees still in the U.S. government. Evans summarizes Truman's claim as follows: "Sad to say, this portrayal of Truman's policy on the home front is almost entirely fiction." One key point that Evans makes is noting that the loyalty/security problems weren't entirely Truman's failure as the Communist infiltration into the U.S. government grew mostly out of the FDR years. "Measured by the total record of his cases and political battles, McCarthy, whatever his faults, was a good man and true--better and truer by far than the tag teams of cover-up artists and backstage plotters who connived unceasingly to destroy him. In the end he perished, politically and otherwise, in the rubble he pulled down around him. Yet when the final chapter in the conflict with Moscow was written, amid you another pile of rubble, he was not without his triumph." Finally, I appreciated very much the way Evans cited his source documentation in this book, especially when he added additional explanatory or clarification notes at the bottom of the applicable page, allowing the reader an opportunity to quickly review the information right then or return to it at a later time. For the fact checkers out there, Evans provides an impressive 24-page Note section of cited information, quotes, documents and much more. Amazingly, he also provides the reader with a Prologue or Preface of sorts explaining important points about his Notes section and follows this with a short Appendix of actual printed copies of "The McCarthy Lists" which McCarthy had, in fact, provided to Senator Millard Tydings identifying more than 100 suspects (critics still claim to this day that this list never existed). An interesting section of Acknowledgments follows, as well as a 20-page Subject Index. Even though this book is long I could not put it down. It is filled with so much documented information of the period in questions where we had lots of security problems in our government and cover up schemes which worked at the time. Some of the obstruction to getting at the truth done then is a constant reminder that nothing has changed today as similar tactics are used. Fortunately, this book lists names and supporting documents to prove Senator McCarthy was right all along that our governmen Even though this book is long I could not put it down. It is filled with so much documented information of the period in questions where we had lots of security problems in our government and cover up schemes which worked at the time. Some of the obstruction to getting at the truth done then is a constant reminder that nothing has changed today as similar tactics are used. Amazing how so many of those who trashed Senator McCarthy held high government positions were blinded by educated and well respected persons who were actually Communists. It seems that not many in the Senate cared about getting to the truth - Was there Communist in the government? Sen McCarthy has been accused of going on a witch hunt but testimony of former Communists and the Verona papers from the Russian archives revealed many of the Communist moles that were in our government also revealed by Whittaker Chambers and Elizabeth Bentley, former Soviet espionage agents who broke from the Communist Party and went to the FBI which led to Senator McCarthy's investigations. Many Communists and fellow travelers were in high positions promoting policies against the U.S. (Algier Hiss, Owen Lattimore, Philip Jaffe, Sol Adler, people in Voice of America to name a few). The State Department covered for many of these individuals and the accused personal files were "rifled through" removing document that were probably very revealing about the employee and would prove embarrassing to the State Department. One such individual given frequent access to the file was high ranking employee later revealed as a Communist. Page 287. Did he or did he not expunge these files? Joe McCarthy dusted off some old files compiled by the Dies Committe during the 30's and 40's that showed there were suspected Communists within our government. FDR and Truman knew of this, as did the FBI and State Department but none of the agencies ever pursued "rooting out" the Red Menace. The issue of Communists within the government was essentially 'swept under the rug'. These issues were unresolved at the time McCarthy found these files and he believed it was necessary and important enough Joe McCarthy dusted off some old files compiled by the Dies Committe during the 30's and 40's that showed there were suspected Communists within our government. FDR and Truman knew of this, as did the FBI and State Department but none of the agencies ever pursued "rooting out" the Red Menace. The issue of Communists within the government was essentially 'swept under the rug'. These issues were unresolved at the time McCarthy found these files and he believed it was necessary and important enough to national security to reexamine these files. It is ridiculous to think that the government would investigate internal issues such as these, without any sort of bias. Russian infiltration within our government is nothing new to this country; it's been going on for decades. This book cites many government records: Congressional Record, Senate transcripts, FBI reports and memos, State Department records, Amerasia, Venona, etc. McCarthy merely resurrected the inquiry about Russian infiltration within our government and he was met with great hostility by many of his fellow Senators. Truman and Eisenhower would not allow documents that were sent from the State Department to the White House to be examined. Senator Tydings did what many politicians do today and that is villify anyone who is trying to get to the truth. Tydings never bothered to fully investigate the charges made against the accused - he simply took their word that they were not Communists. This book languished on my 'abandoned' list for a long time. I had started it from a library book, then moved on and found it again on my e-reader. It has it's moments. The Amerasia Affair was previously unknown to me as was Ann Lee Moss story. There is much to follow up on. The purpose of the book was not a radical reassessment of Senator McCarthy or the House Committee on UnAmerican Activities, but an attempt to at least not make the pro-forma use of 'McCarthyism' go unchallenged. I would bet th This book languished on my 'abandoned' list for a long time. I had started it from a library book, then moved on and found it again on my e-reader. The purpose of the book was not a radical reassessment of Senator McCarthy or the House Committee on UnAmerican Activities, but an attempt to at least not make the pro-forma use of 'McCarthyism' go unchallenged. I would bet that most people who shout 'McCarthyist' think McCarthy had something to do with the Salem witch trials. "Accused of creating a bogus Red Scare and smearing countless innocent victims in a five-year reign of terror...his name remains synonymous with witch hunts." Was McCarthy right all along? This book explores that question and answers it in a way that may surprise some-- Yes. He was. History has proven his concerns to be true, and this book documents the communist infiltration that took place in the highest levels of our government from the 1930s on. How much damage has been done to America and t "Accused of creating a bogus Red Scare and smearing countless innocent victims in a five-year reign of terror...his name remains synonymous with witch hunts." Was McCarthy right all along? This book explores that question and answers it in a way that may surprise some-- Yes. He was. History has proven his concerns to be true, and this book documents the communist infiltration that took place in the highest levels of our government from the 1930s on. How much damage has been done to America and to the world because we as a nation refused to believe the unthinkable? The author or publisher chose to disable text to speech in attempt to force people to buy the audible version. How disappointing and unfortunate. I'm still going to read this book, but the author will not get a Kindle sale from me because I'm going to buy a paperback off the Amazon marketplace. A kindle book without text to speech is worthless to me. I hate it when authors remove this function. It's rude to people with special needs. Plus, you cannot cite pages in an audible version of a book. Excellent read, but, interestingly enough, my mom wouldn't look at the book, because, as far as she is concerned, McCarthy was an evil man. Yet, was he? No, unfortunately, he was right and was vilified for it. A tour de force in investigative journalism; as well as a must-read for American history buffs. An astonishing book. Joe McCarthy is vilified to the extreme in popular discourse, and by conservatives as well. His name gave rise to a popular ism used against totalitarian people. But is it another round of fake history? The winner writes the history books, after all. More so than just the winner, left-wingers write the history books because they dominate academia to absurd degrees (17 to 1 democrats per republican in this study https://www.nas.org/articles/homogeno...), and McCarthy spent ye An astonishing book. Joe McCarthy is vilified to the extreme in popular discourse, and by conservatives as well. His name gave rise to a popular ism used against totalitarian people. But is it another round of fake history? The winner writes the history books, after all. More so than just the winner, left-wingers write the history books because they dominate academia to absurd degrees (17 to 1 democrats per republican in this study https://www.nas.org/articles/homogeno...), and McCarthy spent years targeting communists. So is it any wonder that the real history of McCarthy is not quite what one might expect? In hindsight, no, but the degree was disturbing. American journalist, author and educator. As an undergraduate, Evans was an editor for the Yale Daily News. Upon graduation, Evans became assistant editor of The Freeman, where Chodorov was editor. The following year, he joined the staff of William F. Buckley's fledgling National Review (where he served as associate editor from 1960 to 1973)and became managing editor of Human Events, where he is c American journalist, author and educator. As an undergraduate, Evans was an editor for the Yale Daily News. Upon graduation, Evans became assistant editor of The Freeman, where Chodorov was editor. The following year, he joined the staff of William F. Buckley's fledgling National Review (where he served as associate editor from 1960 to 1973)and became managing editor of Human Events, where he is currently a contributing editor. In 1959, Evans became head editorial writer of The Indianapolis News, rising to editor the following year. In 1971, Evans became a commentator for the CBS Television and Radio Networks, and in 1980 became a commentator for National Public Radio, the Voice of America, Radio America and WGMS-FM in Washington, D.C. In 1974, he became a nationally syndicated columnist for the Los Angeles Times syndicate. In 1977, Evans founded the National Journalism Center, where he served as director until 2002. In 1980, he became an adjunct professor of journalism at Troy University in Troy, Alabama, where he currently holds the Buchanan Chair of Journalism. In 1981-2002, he was publisher of Consumers' Research magazine. In 1971-1977, Evans served as chairman of the American Conservative Union (ACU). In 1974, Evans founded the Education and Research Institute, of which he is still chairman. He has also served as president of the Philadelphia Society, a member of the Council for National Policy and Young Americans for Freedom National Advisory Board, and a trustee of the Intercollegiate Studies Institute (ISI), and is a member of the Board of Advisers of the National Tax Limitation Committee.